Vacation week in February is the most expensive time on the ski slopes, in highest demand, but it’s the only week in prime winter to take the kids skiing with the principal’s blessing. Teachers and school administrators frown on skipping school to go skiing, but the price for school vacation week is enough to make you wince. What’s a family to do? First step, look off the beaten path. While the major destination resorts sell out months in advance at top dollar for February vacation, some smaller family resorts don’t charge an arm and a leg, and don’t get the big crowds. Ski areas like Bolton Valley and Burke in Vermont, Brundage Idaho, or Powder Utah can be better bets for shorter lift lines and lift tickets for less. Check out New Hampshire’s family size ski areas like Gunstock, Ragged and Crotched, the Granite state vacation is a week later than other New England school systems – thinning out the number of kids on their slopes. Think small for big savings. King Pine in New Hampshire offers all inclusive vacation week stays at their Purity Springs Resort during vacation week. It’s like Club Med, only tinier than the French Alps. Families learning to ski can get lodging, lift tickets to the 350’-vertical ski hill at King Pine, three meals a day and use of the heated pool, all for about $120 a day for adults, $40 for kids. February at King Pine is a “wild winter celebration” with fun family races, equipment demos, night skiing, snow tubing, fireworks and bonfires. Last chance, for a snow dance. If you didn’t book last fall (maybe you should have), call ski resorts now and find out about any last minute vacancies or cancellations for a night or two at your favorite resort. 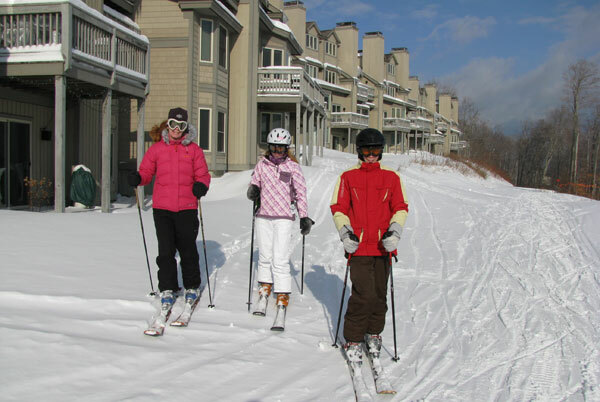 We have been surprised to find midweek openings at Sugarloaf and Sunday River Grand Summit hotels – you can steal away for a few nights during the vacation week and satisfy the family’s craving for carving with two or three days of skiing without breaking the bank on a week’s worth of premium lodging. Taking your family skiing in Quebec during the American holiday provides an almost European ski experience with no airfare expense if you drive across the border, just be sure you have passports fro the kids and yourself, these French speaking resorts like Le Massif, Mont Sainte Anne and Tremblant are culturally unique and the food and après ski is very French too. If all else fails, call your long lost ski buddy with the ski house. Last and least out of your wallet, impose on your friend with a slopeside condo, or a house in ski country but offer to bring breakfast and dinner and your own linens and towels, or take them out to dinner in exchange for staying a few nights. Make the most of your tracks. Be sure to book-end any overnight lodging with skiing on both our arrival and departure day to maximize your time on the slopes (while minimizing your lodging tariff). And of course, hit the slopes early – the best skiing during peak holidays is when the lifts first open (and other families are still sleeping or searching for someone’s lost mitten). Finally, if you find a sweet deal this February, consider booking it for next year. Some properties honor this year’s rates for next season if you reserve with a small deposit as you check out. Then next year’s trip to the mountains is all mapped out.